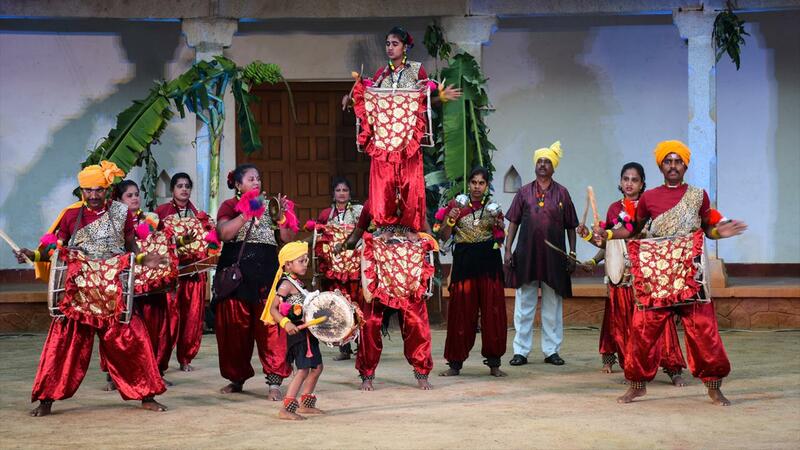 Dollu Kunitha is said to be the most popular drum dance of south Indian state Karnataka. This wonderful form of dance comes with astonishing variety and complexity of skills. Dances of Karnataka are considered to be one of the ancient dance forms existent in India. A major part of the tribal dances is enhanced and still in effect due to the nature-loving culture of Kannadigas and preservation. This ritualistic dance form of Karnataka is immensely popular and is accompanied by decorated drums beats and singing. The men of shepherd community popularly known as Kuruba community mainly perform this dance form. The Kunitha dance form is characterized by quick movements, vigorous drum beats and synchronized group formations. During the performance of Kunitha which is called the drum dance of Karnataka, the dancers involved in extremely supple and swift movements forming a semi-circle. The beat is directed and controlled by a leader with cymbals located in the centre of the circle. Fast and slow rhythm continue to alternate sharing weaves varied patterns. The costume for this drum dance is quite simple. The upper part of the body left bare while a black sheet rug is tied on the lower part of the sarong or dhoti. The Kunitha dance group consists of a dozen dancing partners and artists. Instruments such as tappadi, trumpets, gong and flute are played during the performance. Any village ceremony or ritualistic activities hardly take place without this dance form, especially in north Karnataka. The main story of this dance form is that the demon Dolla-asura was offered boon by Lord Shiva. Dollu ask for immortality. Shiva refuses his request and lets Dollu swallow him. Dollu was unable to swallow as Shiva was getting bigger in size. After that Lord Siva killed Dollu and made drums using the skin of the asura. Kunitha dance form uninterruptedly has gone on generation after generation with raciness of performance and renewed vigour. The Gorava Kunitha, the Pata Kunitha are some of the other forms of ritualist dance forms.